As our theme this year has been levitation, it was important to include this one. Earnshaw’s theorem dictates that in most situations it is not possible to create levitation with stationary permanent magnets. There is one exception; if a magnetic permeability of less than one exists… and it does! 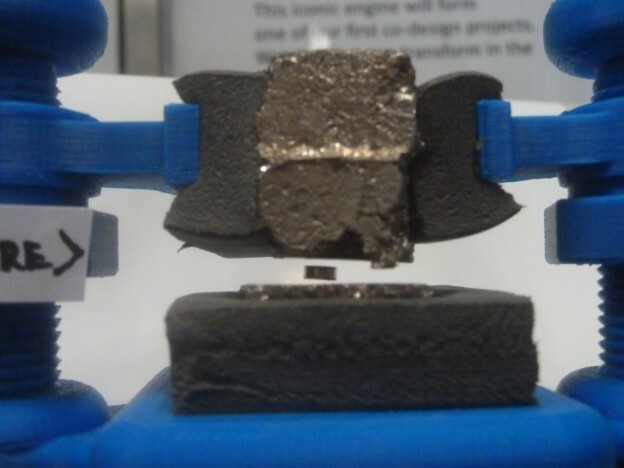 Just as iron and other ferromagnetic materials are attracted to both north and south poles of a magnet, there are diamagnetic materials that repel both. The effect is weak, but just strong enough to make things float. We have demonstrated two systems that use diamagnetic materials to create levitation, one where the magnet is levitated and one where the diamagnetic material itself is levitated. The most exciting thing about diamagnetic levitation is that it is floating as a fact of physics, and doesn’t require any energy to do so! There is a small magnet very stably levitating in the gap between two shiny lumps of Bismuth under a larger magnet. If lightly disturbed it can be set slowly spinning. Otherwise it just floats there minding its own business. There is little more to say. The small magnet is positioned at the equilibrium position under the larger magnet; its weight entirely balanced by the magnetic attraction from above. Normally this equilibrium is very unstable; if it moves slightly upward the attraction increases accelerating it up faster, and if it moves slightly down the attraction drops, and so does the magnet. In this careful arrangement however the diamagnetic Bismuth stabilises the equilibrium. One way to think about it is an inverse r-squared repulsion from the bismuth superimposed on the attraction of the large magnet further away. The proximity of the bismuth makes the repulsion gradient stronger than the gradient of the supporting attraction. 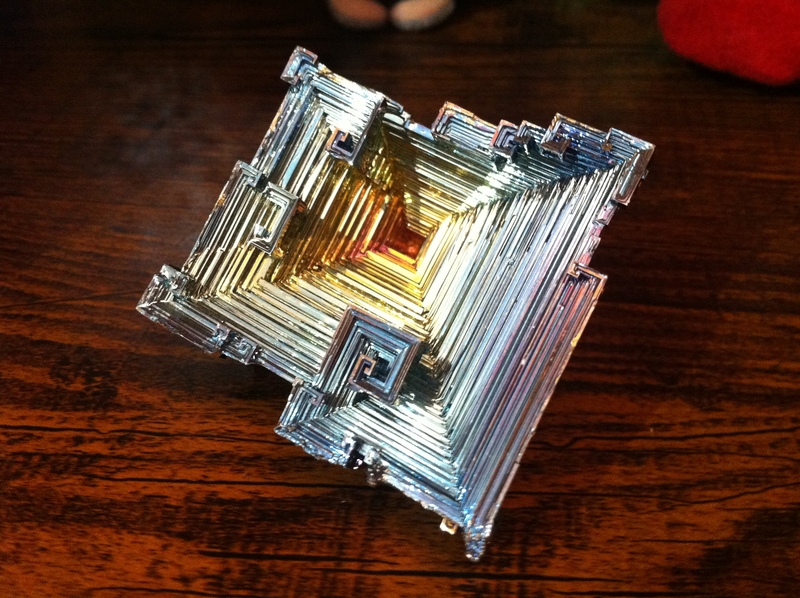 As the small magnet moves up the attraction increases a little, but the repulsion from the upper bismuth dominates. Similarly as it moves down, the repulsion from the lower bismuth more than makes up for the drop in attraction. 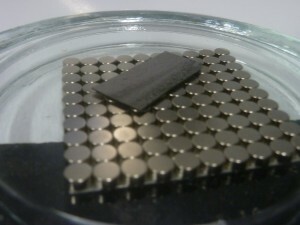 The weakness of the diamagnetic repulsion limits the scale of the levitation, as the large magnet will need to be much further away than the bismuth, and the bismuth needs to be large enough to significantly affect the magnetic field. Bismuth is the most diamagnetic of all the elements. I’m not aware of a stronger diamagnetic material at room temperature (superconductors are perfectly diamagnetic, but need to be kept VERY cold, breaking the no energy levitation appeal). Therefore it is the best choice for this application. 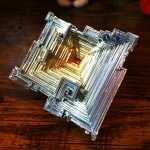 It is worth me saying here (in danger of sounding a bit geekier than normal) that bismuth is also my favourite element. Not only is it awesomely diamagnetic, it has several other things going for it. It is one of the few materials (like water) that expands on freezing, meaning bismuth-bergs float in molten bismuth. It is non-toxic and relatively unreactive in air so is easy to keep. It forms an awesome square spiral/staircase crystal structure if you cool it gently with a single crystal seed. When heated it oxidises to depth in the optical light wavelength range giving it iridescent colour. How is the rig arranged and why? Firstly, it is important to be able to set the equilibrium position very accurately. To this end the large magnet is attached to a screw thread that can be finely adjusted up and down above the base.This screw thread is 3D printed with the rest of the part as an M16 x 2 thread with a simple profile drawn in solidworks and swept. It works as printed with no need for tap or die, and in this case was deliberately made very stiff to avoid accidentally detuning (It turns out that screw threads work really well printed on the UP, we made some good free spinning M8 x 1 nuts and bolts too). The base mounts the lower lump of bismuth. I liked the irregular crystalline look of the bismuth I acquired and didn’t want to melt it to a more convenient shape for mounting so I decided to mount the bismuth by pressing it into some stiff high density foam, levelling it manually as well as possible. A moveable upper mount is suspended from free spinning nuts on two threaded support columns. 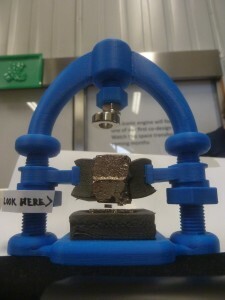 This allows the upper bismuth, attached to the mount by more foam, to be positioned. The screw threads required a lot of adjusting to get the magnet to levitate correctly but the set up is now relatively robust, with only an occasional tweak to the top screw after being rattled in transit to get the magnet floating. It is worth saying that like the dart floating rig, this rig was also designed built and finished in a single evening after work… 3D printing really does make a difference. While bismuth is the outright winner in terms of diamagnetic effect, pyrolytic graphite has a substantially lower density, and can be cleaved into very thin sheets. This allows the piece of PG to be light enough to float on a bed of strong magnets. 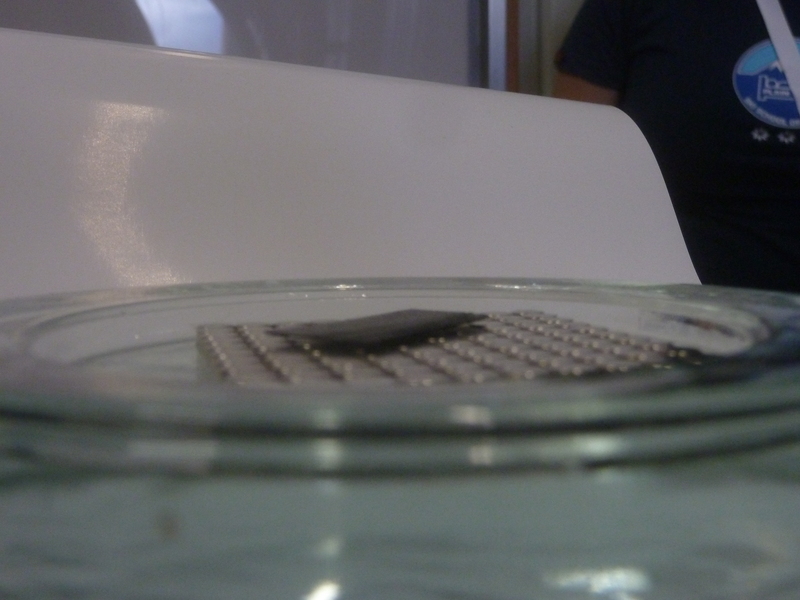 No tweaking screw threads required, you just need to arrange some strong magnets in a chequerboard arrangement on a square of steel and the PG does its thing, floating up to 1mm above (depending on PG quality and thickness as well as magnet array strength). Not much effort to make really. A couple of interesting things to note… pyrolytic graphite is actually multiple well aligned layers of graphene deposited in a process called pyrolysis. While not quite as amazing a material as graphene, PG doesn’t limit itself to floating strength diamagnetism any more than bismuth does. Another of pyrolytic graphite’s super powers is that it has exceptional in plane thermal conductivity, so much so that by holding it with warm fingers you can use it to cut ice cubes in half by transmitting heat to the cutting edge so effectively.